Dj. 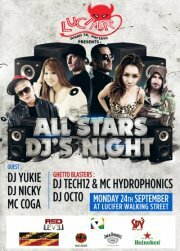 Roxy June is the most pretty lady Dj in Thailand and last garantee award from pioneer pro DJ. She the winner from Pioneer Dj Lady Championship 2010.Dj. 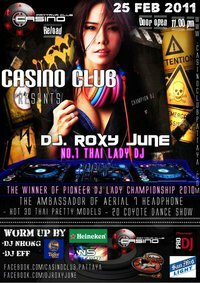 Roxy June will come to rock you on 25 Feb 2011 at Casino Club Pattaya.Door open midnight till late.Also the night you will meet more 30+ Thai ladies models and 20+ Best coyote dance girls in Pattaya.Not fotget to come early to take your sit.And rock more with Pioneer pro DJs.